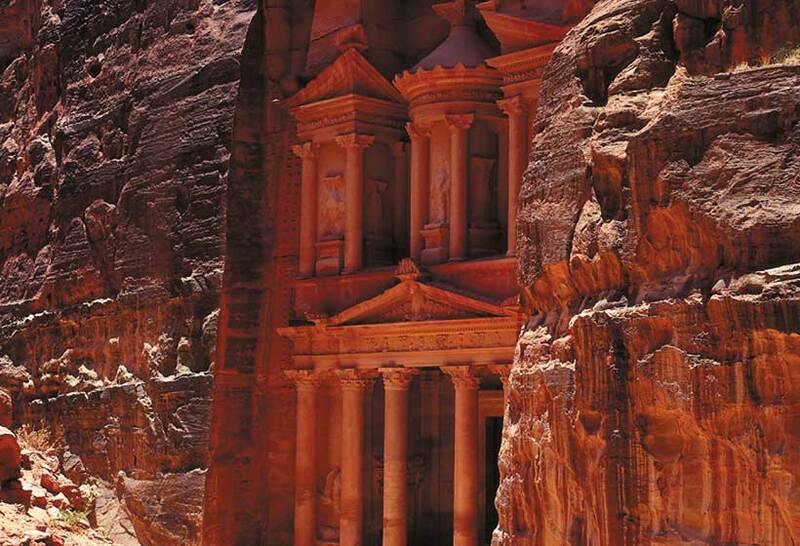 With its ancient ruins, lush valleys, and dramatic desert landscapes, Jordan is a nation steeped in history. Renowned as the birthplace of some of the world’s earliest civilizations, the country remains one of the Middle East’s most remarkable destinations – as reflected by its inclusion on Lonely Planet’s recent list of the Top 10 Countries to Visit in 2019. Jordan placed at #6 on the annual list of ten countries primed to capture travellers’ imaginations, and was the only country in the region to receive this prestigious accolade. 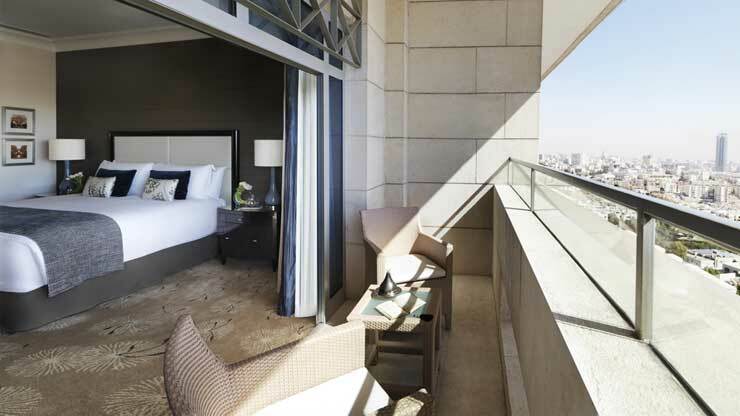 With its central location in Jordan’s capital city close to upmarket residential areas, Four Seasons Hotel Amman offers the ideal base for discerning travellers seeking to explore the Kingdom’s myriad attractions. Enjoying a commanding position on the highest of Amman’s seven hills, the 15-storey Hotel is a beacon of elegance at the heart of one of the region’s most welcoming cities. The historic sites of Petra and Wadi Rum, the spectacular landscape of the Jordan Valley and the storied waters of the Dead Sea are all within easy reach, with the knowledgeable Four Seasons concierge team happy to make arrangements for guests to enjoy an array of exciting excursions. 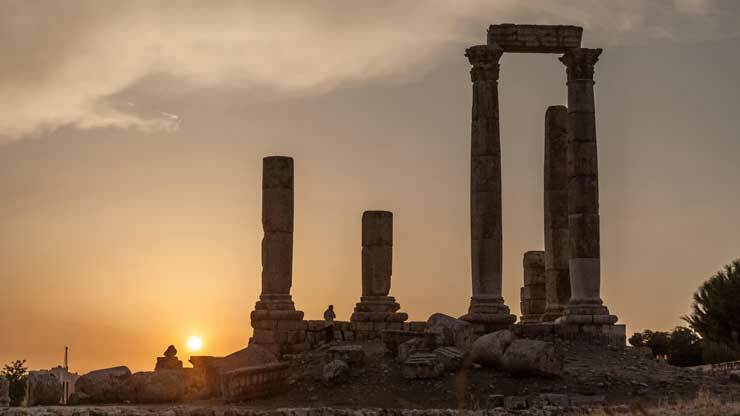 Home to almost half of the Kingdom’s population, the Jordanian capital of Amman is a city of fascinating contrasts. The vibrant metropolis occupies a hilly area on the edge of the fertile Jordan Valley, where visitors will find modern buildings, hotels, restaurants, art galleries and boutique stores sitting side-by-side with reminders of the city’s ancient past. Its charming tree-lined streets and avenues are flanked by picturesque rows of white houses clad with Jordanian limestone. The city is perhaps best known for its spectacular Roman ruins, with the famous Amman Citadel attracting visitors from across the globe. This storied enclave features the Temple of Hercules, Umayyad Palace and the ruins of a 6th century Byzantine church, together with the Jordan Archaeological Museum where travellers can view a collection of artefacts that date back to the Bronze Age. Four Seasons Hotel Amman invites guests to embark on an Extraordinary Experience with a unique opportunity to explore this beguiling city in the company of Zohrab Markarian, a former official palace photographer whose work has been published in prestigious magazines around the world. Markarian will guide budding photographers on a tour of Amman’s top landmarks, including the Old Souk and the 2,000-year-old Roman Theatre. 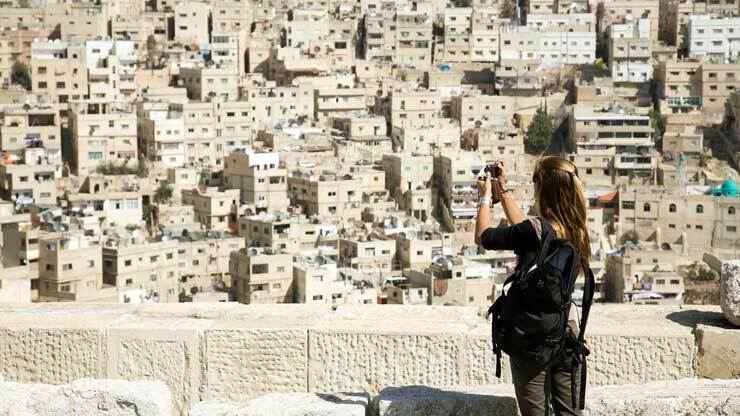 This is followed by a stop at the Citadel in the heart of Old Amman, which offers a perfect opportunity to capture the beauty of the surrounding mountain landscape. The tour concludes with stunning views of Old Amman’s architecture and a traditional Jordanian tea in the artistic heart of the city. Throughout this incredible journey, Markarian will share photography tips and local insights, all while capturing picture-perfect mementoes of the experience. Chosen as one of the new Seven Wonders of the World in 2007, a trip to the ancient city of Petra in Jordan transports visitors back in time to the era of the Nabatean Empire. Home to an estimated 20,000 inhabitants, the city prospered thanks to its location on the Spice Road, one of the key trading routes connecting Arabia, Africa and India to the West. The incredible carved rock faces of the ancient city offer a fascinating glimpse of this early civilisation’s prosperity and advanced architectural methods. Must-see attractions include the iconic Treasury, the Street of Facades, the Royal Tombs and the Great Temple. Discover the allure of the desert at the Wadi Rum protected desert reserve. Also known as the Valley of the Moon, Wadi Rum is famous for its red-pink sands, endless shifting dunes and dramatic mountain landscape. The area has served as a location in countless movies, and is home to many Nabatean temples, inscriptions and rock drawings. Located around four hours from Amman, the Four Seasons team can arrange a captivating day out to this beautiful destination. Located in the south of Jordan, Aqaba is the Kingdom’s only coastal city and a highly popular spot among diving enthusiasts. The area off the coast is home to more than 25 dive sites encompassing vibrant coral gardens, pinnacles, deep canyons and shipwrecks, including many unusual vessels. Its warm clear waters and colourful reefs are considered the finest in the Red Sea. A short walk from the bustling waterfront, the city’s old town area captures an authentic taste of old Arabia with its traditional souqs, historic sites and charming cafés. One of Jordan’s most famous visitor attractions, the Dead Sea is a salt lake whose banks are more than 400 metres (1,300 feet) below sea level – making it the lowest point on dry land globally. The high concentration of salts in its water offer a unique experience, as the saline waters provide increased buoyancy, making it easy to float on the surface. The mineral-rich mud found in the area is also renowned for its therapeutic qualities and a popular ingredient for high-end cosmetic treatments. The legendary body of water is surrounded by mountains to the east and the rolling hills of Jerusalem to the west, creating a stunning environment in which to enjoy a swim like no other. Connect to authentic local experiences around the historical town of Um Qais, which sits in close proximity to the ruins of ancient Gadara and overlooks the Lake of Tiberias and the Yarmouk River gorge. The town is around two hours north from Four Seasons Hotel Amman, and the Hotel’s concierge team can arrange a comfortable vehicle for guests to enjoy a leisurely trip through the scenic countryside. 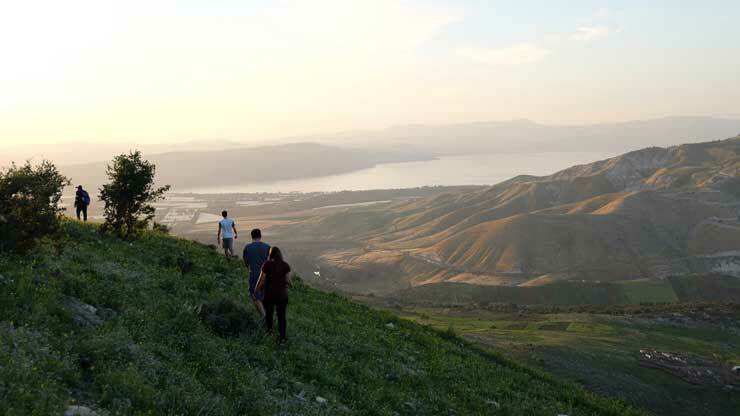 Located in the hills above the Jordan Valley, Um Qais offers an abundance of hiking, cycling and camping activities. For the ultimate return to nature, Four Seasons Hotel Amman can arrange a special camping getaway where guests can spend an unforgettable night under the stars. While Friends was primarily filmed in a studio, the West Village apartment where Rachel, Monica, Joey, Phoebe, Ross and Chandler live and hang out is a real building on the corner of Bedford and Grove Streets. At its street level, you will find Mediterranean restaurant The Little Owl in the same space as the Central Perk café where Rachel works and Phoebe famously performs “Smelly Cat.” Additionally, the neighborhood houses a number of prominent Off-Broadway theaters including The Lucille Lortel Theatre, where aspiring actor Joey performs in the show’s earlier seasons. While retracing Ted’s 11-season search for his wife, be sure to grab a drink at McGee’s, the Midtown Manhattan bar that inspired the gang’s go-to spot, MacLarens; try what Marshall declares to be the best burger in NYC at ‘21’ Club; tour the Columbia University campus where Ted (unwittingly) first meets his wife; and have a legen…wait for it…dary time at NYC icons featured in the series, such as the American Museum of Natural History and Empire State Building. The iconic address of the studio where Liz Lemon, Jack Donaghy, Jenna Maroney and Kenneth Parcell make the sketch comedy show TGS with Tracy Jordan is the actual home of NBC Studios. The Tour at NBC Studios offers a behind-the-scenes look at 30 Rockefeller Plaza, including Saturday Night Live, the source of showrunner Tina Fey’s inspiration for the beloved comedy. Contrary to Jerry and friends’ experiences, nobody will yell, “No soup for you!” at The Original Soupman on West 55th Street in Midtown or at the eatery’s kiosk in Times Square. Meanwhile, Morningside Heights’ Tom’s Restaurant (Monk’s Diner) has all the great no-fuss comfort food and 75-cent coffee the cast enjoyed on-screen. Finally, Gray’s Papaya really does have some of the best hot dogs in the City—“better than filet mignon!” if you ask Kramer. Thirty years later, you can still have what Sally was having at Katz’s Delicatessen on the Lower East Side, double date at the Upper West Side’s Café Luxembourg, and enjoy the beautiful scenery of Washington Square Park, where Sally first tells Harry to “have a nice life” at the beginning of the film. Relive this ’90s romance at sites of important scenes such as Café Lalo on the Upper West Side, “The Most Famous Café in the City”; Zabar’s, the great local market where Joe saves Kathleen’s Thanksgiving; and the 91st Street Garden in Riverside Park where the film concludes as the pair realize their feelings for each another. New York City has often been said to be the series’ fifth character, and fans can get retail therapy at the Greenwich Village boutiques Carrie and friends frequented, snack on cupcakes at Magnolia Bakery, walk with a loved one to the middle of the Brooklyn Bridge, and do your best to catch a foul ball (and a date) at a New York Yankees game—to live like Carrie and the girls. On Manhattan’s Upper East Side, visitors can climb the steps of The Met Fifth Avenue, where Blair and company famously held lunch breaks, before heading further uptown to the Museum of the City of New York, filmed as the Constance Billard and St. Jude Schools. After getting spotted at these elite schools, you can check out the home of Chuck Bass and the Van der Woodsen family at the Lotte New York Palace, just five blocks north of Grand Central Terminal, where Serena makes her dramatic entrance to the show in season 1. See where Hannah, Marnie, Jessa and Shoshanna try to navigate their early 20s. In Greenpoint, Brooklyn, enjoy a latte at Café Grumpy, the real coffee shop that is fictionally managed by Ray and frequented by the girls, and venture to Manhattan to see when the story begins as Hannah’s parents tell her they will no longer financially support her, at Murals on 54 restaurant. While the film’s famous battle of New York included scenes all over the City, most of the action takes place in Midtown Manhattan. Captain America, Iron Man, Thor, Black Widow and Hawkeye first meet the alien attackers in front of Grand Central Terminal, while Stark Tower is a couple of blocks west at 4 Times Square, formally the Condé Nast Building. In the end, Hulk defeats Loki for good, with Manhattan still standing, in front of the historic Chrysler Building before Thor beams him back to Asgard for trial from Bethesda Terrace in Central Park. The masked hero that earned NYC the nickname “Gotham” has been portrayed in areas throughout the City for more than 80 years. With his Wayne Enterprises headquartered at One Liberty Plaza, just a block from the World Trade Center in Lower Manhattan, Batman defeats Bane in the final fight scene of the Dark Knight trilogy on the steps of the New York Stock Exchange while the Queensboro, Brooklyn and Williamsburg bridges also play prominent roles in the film. Your friendly neighborhood Spiderman has made harrowing rescues all over NYC over the years. In the original Spiderman film, Peter Parker saves love interest Mary Jane from the Green Goblin in Times Square before defeating the villain on Roosevelt Island. Other high-flying fights in the films take place at the Empire State Building, Statue of Liberty and Ellis Island. The 1984 paranormal film has found new life in New York City thanks to the Ghostbusters Experience at Madame Tussauds New York in Times Square where visitors can fight ghosts through a hyperreality experience. 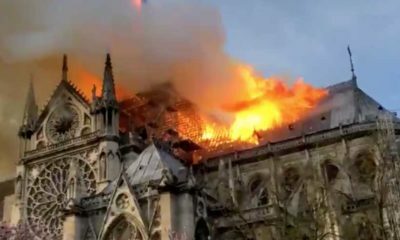 In addition, the functioning firehouse Hook & Ladder Company 8 (Ghostbusters headquarters), Spook Central (55 Central Park West) and The New York Public Library – Stephen A. Schwarzman Building are film locations that can be visited. Agent K and Agent J fight aliens all over the five boroughs in this action-packed trilogy. In two of the most prominent scenes, Agent J chases and captures the first alien he encounters on the job in the Guggenheim Museum on the Upper East Side, and the agents save the galaxy in Corona Park, Queens, after thwarting a hidden spaceship that lived atop the World’s Fair site for years. In addition to the Costume Institute Gala at The Met, targeted by the crew in the film and featuring “Camp: Notes on Fashion” this May, several prominent NYC landmarks are featured in the latest installment of the Ocean’s franchise. The TWA Flight Center at JFK, soon to be the TWA Hotel (opening May 15), houses the fashion show where Debbie Ocean and crew recruit an integral teammate; the Cartier Mansion guards the necklace they are after; and a Bushwick, Brooklyn, loft acts as the team’s headquarters. 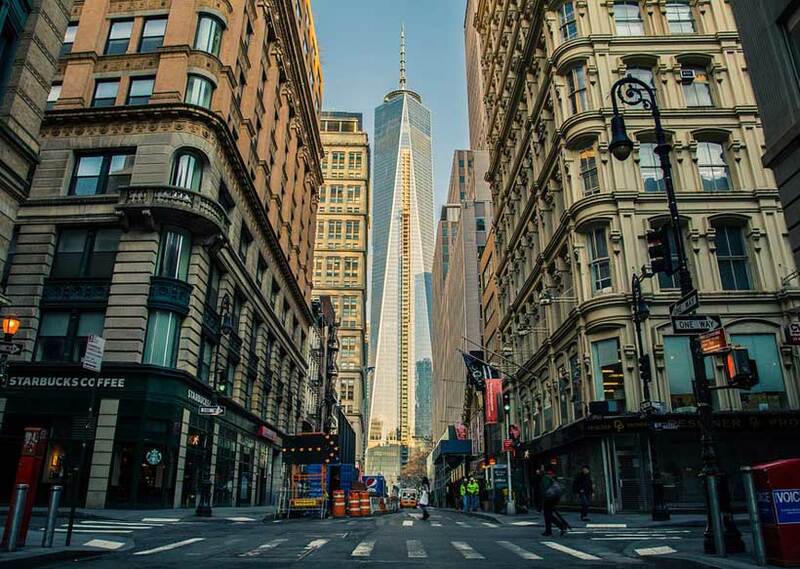 Although Kevin didn’t mean to visit New York City, he managed to check out some of the best attractions in Midtown Manhattan while he was there. As he successfully thwarted the bandits’ plan to rob Duncan’s Toy Chest (filmed at FAO Schwarz), Kevin also enjoyed all the amenities offered at The Plaza Hotel, caught a show at Carnegie Hall from a VIP point of view, fed the pigeons in Central Park and met family at the Rockefeller Center Christmas Tree. Imposter substitute teacher Dewey Finn and his students put on a show for their “final exam” in a Battle of the Bands shot inside Staten Island’s St. George Theatre, while their yearlong practice at Horace Green Prep School was filmed at the borough’s Wagner College. At the Museum of the Moving Image in Astoria, Queens, The Jim Henson Exhibition provides an illuminating behind-the-scenes look into the creation of iconic productions The Muppets and Sesame Street, filmed to this day at Kaufman Astoria Studios. Character sketches, scripts, clips and unseen footage are among the nearly 300 items on display celebrating Henson’s work and Legacy. Although the American Museum of Natural History on the Upper West Side closes at 5:45pm, you can still see the exhibits protected by night guard Larry Daley in the film, seven days a week. One of the most prominent characters, Rexy, is now in a temporary solo exhibit including fossils, virtual reality experiences and life-size T. rex models that explore this famous predator in greater depth than ever before. In addition to providing the backdrop to some of the most iconic moments in TV and film history, NYC is home to countless live television experiences and various film and TV festivals. 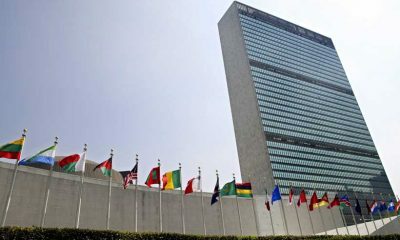 For a deeper dive on a film- and TV-inspired visit, go to nycgo.com. Visitors looking to explore TV and movie locations with the help of an expert can also check out curated experiences by On Location Tours. 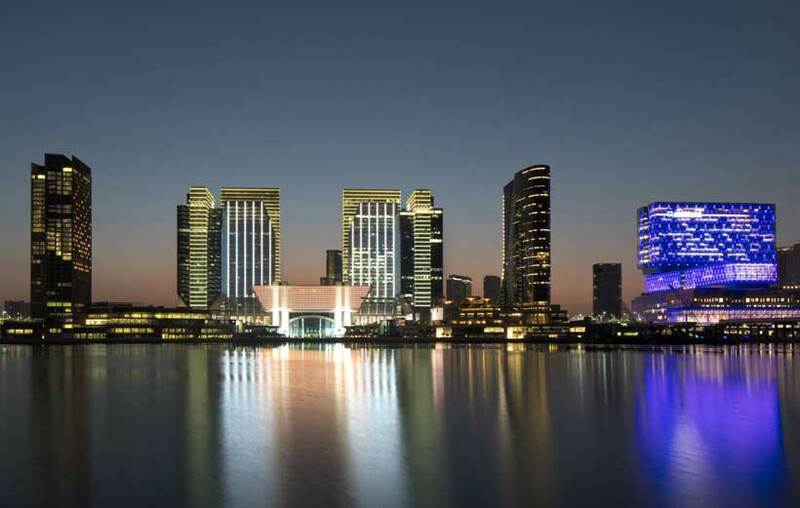 Al Maryah Island has a wealth of world-class dining and shopping. Exotic flavors from near and far are the biggest attraction with over forty options including our very own award-winning restaurants Butcher & Still, and Cafe Milano; not to mention, Zuma, Coya, and Le Petit Maison. Guests can also shop until they drop in The Galleria, the city’s most exclusive shopping experience filled with the luxury brands. 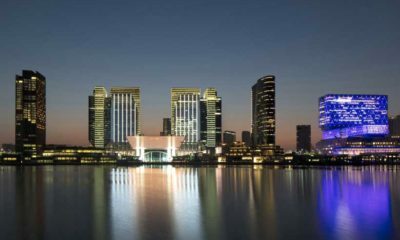 This is only set to amplify with the city’s latest mega-mall Al Maryah Central opening mid-2019 with over 400 retail outlets and 100 restaurants. Health & Wellness is another key focus. The Island is fortunate to have one of the region’s premier hospitals, Cleveland Clinic, which has some of the world’s best doctors and highly personalized care. On property, Dahlia Spa in Four Seasons Hotel Abu Dhabi, encapsulates this holistic wellness approach by providing guests a results-driven approach through customised experiences crafted by an international team of spa experts. Just a few hours from the bustling Colombian capital lies Villa de Leyva, a tranquil town littered with whitewashed stone houses dating back to the early 17th-century. 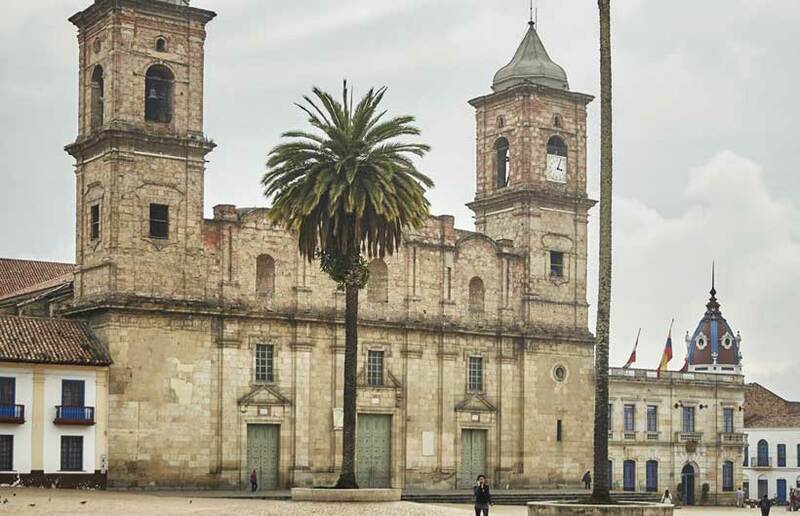 The colonial-era town, northeast of Bogota and with a warmer climate, boasts winding cobbled streets situated around what’s claimed to be the largest stone square in South America. A day trip to the town can be easily arranged with the assistance of Four Seasons Hotels Bogota or Four Seasons Hotel Casa Medina Bogota. Visitors can explore the Pozos Azules, a series of bright blue artificial pools, which are situated only a five minute drive away from the central plaza. Other activities include a visit to architect Octavio Mendoza’s 5,400-square-foot house, which is made entirely out of clay. The Casa Terracota is an abstract piece of art, which one could imagine Antoni Gaudí would be proud to call his home. The clay abode can be explored on by foot and is just a 30-minute walk from the central square. Mendoza refers to his work as the largest piece of pottery in the world. Members of staff at Four Seasons Hotels Bogota can also assist guests in planning activities for the day trip to the town. Guests who are interested in adventure activities can rent mountain bikes and cycle around the mountainous and historical trails of the town. Cycling tours are also available, which stop off at all of the main points of interest, while some offer coffee and wine tasting. 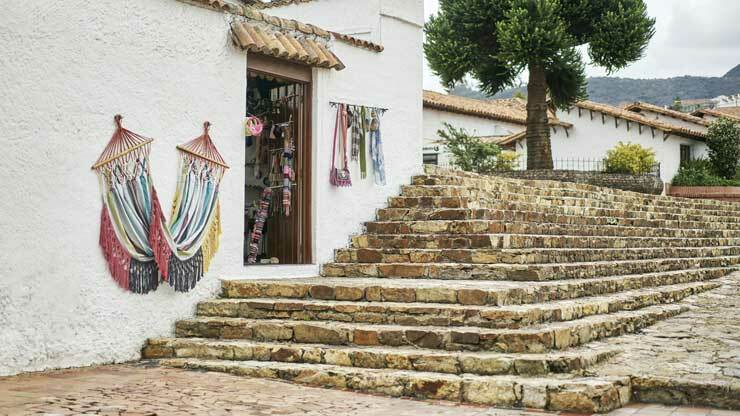 The local people of Villa de Leyva offer a warm and hospitable welcome, and there are plenty of local family-run restaurants, bakeries, and shops. A few minutes walk from the main central plaza are winding cobbled streets lined with artisan gifts and crafts, which are made by locals. One shop, in particular, serves fresh home-made hummus. 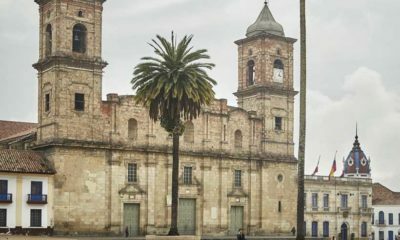 The town, which is part of the Boyaca department of Colombia, is formerly a colony of Spain and gained independence in 1812. 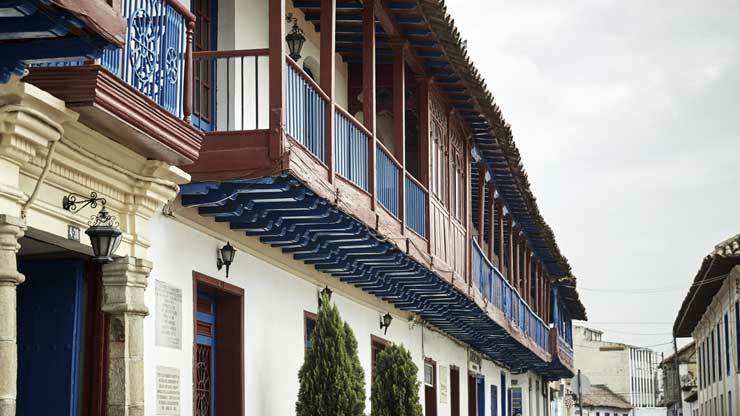 Visitors may also recognise the town from Gabriel García Marquez’s novel Love in the Time of Cholera, as the main character Florentino Ariza spends part of his life in Villa de Leyva. 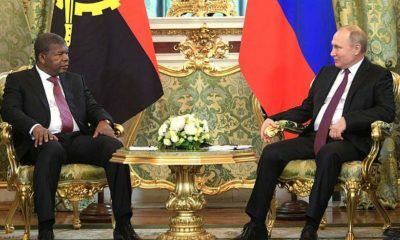 As well as a rich historical significance, the place also has a strong scientific background. The valley in which it’s located is rich in fossils and even has a paleontology museum dedicated to the hundreds of artifacts that have been discovered.